Well, I finally got my D700 and have had it for about a week now so I wanted to put up some initial impressions of the pros and cons from an experienced amateur’s perspective (been taking photos for almost 15 years now, but I wouldn’t consider myself in any way a professional). I am VERY pleased with the full-frame CCD. Before this camera, I had the D100 and was happy with it, but always was a bit annoyed that my Nikon lenses were converted by the different size of the CCD. Now that I’m back to 35mm, I feel like the SLR acts a lot more like my old N90s. My favorite lens, the 85mm 1.4 produces astoundingly beautiful shots with increadibly shallow depth of field. I’m in heaven. On the whole, the features I’ve used so far have been quite impressive. At normal ISOs the quality is just outstanding. I don’t think I’ve ever seen digital pictures with this level of detail period. This said, what really impressed me was the 6400 ISO. I’ve played around with a number of digital cameras over the years and I don’t think I’ve ever seen a camera that can produce the kinds of low-light images that the D700 does. The noise is so unbeleavably low that I am just floored. I’ve been using a 16gb Sandisk Extreme memory card and have been very impressed with the write-speed of the camera. On RAW quality imaged, I can get 800+ shots to the memory card and the transfer rate to the computer is excellent considering the size of the files. Shooting speed is also excellent. I do mostly portraits, but when I do candids I do find myself shooting multiple shots in succession and the D700 performs wonderfully. It does make me curious as to how much faster the D3 is, but I can’t imagine it being that much faster. Some minor gripes (I would discount 1/2 star for these if I could, but rather than rating the camera at a 4, I’m giving it a 5 because I am very happy with it). 1. The live-view is somewhat odd in the way that it works. I was hoping that the camera would lift the mirror and then basically become like an average point-and-shoot. It doesn’t really work that way and frankly, makes me appreciate the view-finder all the more. The instructions to get the live-view to work are somewhat complex (it isn’t just a switch, you also have to go into menus, make selections, and then depress the shutter button half-way each time you take a picture in order to activate the live-view every time). It is a nice option for when you can’t look through the viewfinder easily, but definitely not for all-the-time-use. 2. Software compatibility has some quirks. It seems to me that my Cannon worked with XP and Photoshop right out of the box, whereas with this camera I had to go to Nikon’s website and download Codecs in order to get my computer to recognize RAW images… also… why does Nikon insist on calling RAW images NEF files? Seems to add a layer of complexity that is just unecessary. Another odd thing is a note on Photoshop’s (Adobe’s) website which tries to let consumers know that Nikon and Adobe are “comitted to working together” but actually seems to have the opposite effect given the tinkering that is necessary in order to get NEF files recognized. That said, now that I’ve got it all set up properly, it works fine and I’m very happy. Summary: Seems to pack all the bang of the D3, but at a nice savings. Definitely not cheap, but you get what you pay for and it is very nice to be putting my Nikon lenses to good use. Picture detail and quality is through the roof, impressive low-light sensitivity. Full-frame CCD is awesome. Camera feels great in the hand, solid construction, good menus, dials, buttons, etc. all feel great. There are already a lot of reviews of the D700 on Amazon.com so I will focus on the current D200 user who is considering upgrading to a D700. If affordability is an issue and/or you have a lot invested in DX lenses (I will explain why later), skip the D700 and either buy a D300 that are being discounted since it is late in its product life cycle or wait for a successor to the D300. Another alternative to consider is the new D90. I’ve been using the D700 for about a month and will offer more subjective than quantitative comments. If you want a technical review, I would recommend the D700 forum at nikonians.org or Ken Rockwell at http://www.kenrockwell.com (even if you don’t agree with him, I think he provides a valuable service to the photography community). 1) It is just outright faster (remember I am comparing it to a D200) – I shoot a lot of “capture the moment” photos(okay, you can call them “snapshots”) and the D700 focuses and meters noticeably faster. This is very important when I am covering events and taking photos as opportunities present themselves. I may only have one chance to get the photo right (I do shoot in continuous mode but not necessarily with bracketing). 2) The photos I take, especially the colors, appear to be much more accurate (again, just a subjective opinion). I use Photoshop CS4 a lot but fine that with most photos that I take with the D700 there is not a lot of need to make adjustments for levels, sharpness and hue/saturation. Most of the time I just crop/resize and print – this saves me a lot of time. Most of the time I am using matrix metering and auto-area focus. The auto white balance works great although I am shooting RAW right now since the outdoor shots where I live are in the snow. 3) The D700 with its great photo quality at higher ISOs allows me to take more available light (not necessarily limited to low light) photographs especially indoors and late afternoons/early evenings. I like this a lot because I find it less intrusive than taking people photos with a flash. There is no red eye problems; people don’t tend to freeze up; and it minimizes lighting issues. However, the big “BUT” is that you are likely to need to buy the newest Nikon full frame lenses if you really want to achieve faster, better and available light photos. There has been a lot of criticism of the 24-120mm/3.5-5.6G kit lens but I think it is just fine for a general “walk around” lens. If you are shooting in lower light situations or a single subject focus in aperture mode, then the constant apertures found in the 24-70mm/2.8G and the 70-200mm/2.8G is really what you need. You can add the 14-24mm/2.8G if you do landscapes. They are expensive, big and heavy but they are as fast and sharp as can be. Older full frame Nikon lenses work well and will take great shots but they are slower (ex. I have an 80-400mm without the internal motor so it is noticeably slower). Prime lenses would be good alternatives. Overall, there are fewer available lenses for full frame since a lot of the current product focus is on DX lenses for the various lens manufacturers (not just Nikon). A couple of final comments – first, I was originally going to sell my D200 to defray the cost of the D700 but decided that there are situations in which I can only take one camera and weight/bulk is an issue. For example, my D200 with the 18-200mm lens is perfect for an upcoming vacation in which I have to fly, not drive. It is a good “walk around” camera. So the D700 has become by camera with a purpose. In my case, this is when I want to take high quality photos at an event such as a wedding or a concours (I like cars as well). Second, the Canon EOS 5D Mark II is an alternative worth considering, especially if you are going to buy new lenses anyway. 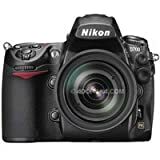 I did not consider it because I am very use to and comfortable with the Nikon controls and don’t want to risk missing a shot fumbling with how to change some setting. Bottom line – I love the camera and would highly recommend it to any D200 user considering upgrading to a D700. The D700 is an excellent camera, especially in low light situations. I have taken landscapes by moonlight with this camera at ISO 6400 and almost no noise. The 24-120mm kit lens however is not so good. Severe vignetting at the 120mm end, and also loss of sharpness in the corners at all focal lengths. Having said that, Amazon was selling the kit for less than a lot of other retailers were charging for the camera body. I am using some older Nikon glass which was produced mainly for film cameras . Works great with the D700 being a full frame sensor. These lenses give excellent results. I have given 5 stars because the camera is worth it, pity about the lens. Excellent camera.. if you read the specs carefully it is nothing but a D3 in a smaller body and for $2000 less..D3 has a slightly better viewfinder and slightly faster.. with MB-D10 even you can reach upto 8 fps with D700. Since I ran out all of my budget I could not afford another expensive lens. So went with 50mm f1.8 lens.. It’s a great combination.. If you can shell out another 150 [..] then go for 50mm f1.4 lens. I am now enjoying this camera and the lens and the pictures are amazing. First — I love this camera. I haven’t had a dSLR that has behaved exactly like my old Nikon film cameras until the D700 — it works with all my old Nikon lenses, and the full frame format is excellent. It is 99 percent of the D3 with only half the price. Second — I got the kit through Amazon only because the camera with the kit lens was cheaper than anything being sold locally for the Body Only. As prices drop, and if it becomes available on Amazon, purchase the Body Only and get your own lenses. The Kit lens is basically unworthy of this camera body. It has a nice range and the VR is nice — but it is soft across the entire focal distance range, and there is severe vignetting at 120 — some of the worst I have seen in a Nikon lens. Finally –for those of you upgrading from a D200 or a D300, you hopefully know by now that your old DX lenses will work on the D700, but it will crop them to 5.1 megapixels (even the D40 has 6! )…unless you already have a lot of FX lenses (G-series lenses and the like) you are going to be spending additional money on lenses for the full format camera. I am surprised how many people don’t do their research, but the D700, and then are upset that they have to shell out more money for additional lenses. As to lenses, my personal suggestions without breaking your bank: The Nikon 50mm 1.4 G lens – it’s sharp and works great on this body. It becomes a walk-around lens. The Tamron 28-75 2.8 lens — a fantastic zoom lens at 1/3 the price of the Nikon equivalent and possibly better IQ — and either the Nikon 70-300 VR G lens or the Tamron 28-300 VC lens (That’s what I have, and it is sharp and wonderful for large focal length situations). In a pinch, the old Nikon 28-80 G (the one that starts at 3.3) that came on old film bodies of the early 2000’s creates awesome sharp photos and is a steal for 60 bucks from resellers. Hi buddy, your blog’s design is simple and clean and i like it. Your blog posts are superb. Please thick them following. Greets!